The aim of this article is to provide some information on questions we receive frequently in the Discord, as well as some videos and guides on how to perform certain mechanics. Combo videos in themselves are not here because there isn’t exactly a set way to play Sorc, it requires knowledge of the potential cancels and ways to move that will let you adapt to your situation. The best way to learn how to play is simply through trial and error to work on building muscle memory, learning timings and the other classes. Without a grab we do not have the ability to force openings and so we have to know when and how to engage and disengage safely. Some of the information may seem vague or not direct enough but that’s to encourage you to do your own research and testing. What works for some may not feel the same for others and without the ability to make your own conclusions you will not be able to play Sorceress as effectively as some. Risky to play and difficult to master, Sorceress provides an engaging play experience that is rewarding and makes it boring to play other classes. If you can’t find anything here or think anything should be added, feel free to ask in the Discord. What skills do I use for Pre-Awaken grinding? It really doesn’t take that long to get to 56, you’re basically going to be mashing Claws of Darkness (S + LMB), Dark Flame (S + LMB + RMB), Black Wave (S + RMB > S + LMB + RMB), Dream Of Doom (Shift + E) and Shadow Eruption (Shift + F). Go for back and down attacks, figure out which abilities CC then play around and have fun. You can also use Bloody Calamity (Shift + A/D > Space) for some extra healing. How do I regen Mana while grinding? Good shard management is a necessary skill to develop. The Q buff not only gives an AP Bonus but can also be used to regenerate Mana, by combining it with Dark Trade you are able to absorb twice in a row for a more sizeable Mana boost although the AP Buff will just reset itself. If you’re still having troubles keeping your mana up, the best recommendation is to take the Mana on Hit addon for Dream Of Doom. Hitting a pack of mobs with it will usually give you 70% of your Mana back and is useful for mindless grinding when you don’t feel like paying attention to using your shards to do it. What skills do I need to lock? Locking a skill prevents it from being used unless activated through the hot-bar, this can prevent mishaps when you have sloppy input and stamina management. Locking a skill is done by mousing over it in the skill menu and clicking on the little lock at the top so it is closed. Locking Evasion in the top right of Main is a must as it will prevent you from combat rolling when you are out of stamina. The rest here are personal preference : Bloody Contract (Personally I use it when I need to heal in a safe spot or to gain just a bit of HP to get into BA/RBF, not actually that effective of a skill, but I’ve seen it suggested. ), Abyssal Flame (Makes it easy to mess up Dark Flame, although so does having Absolute Darkness, but at least then you only have one way to do it incorrectly. Abyssal Flame when used from the hot bar cannot be charged. ), Mark of the Shadow, and Soul Harvest (If you’re holding Spacebar down before you go to cast GRJ, you’ll Soul Harvest instead of charging GRJ and probably die). Depending on your play style, you can lock and then hot bar Scattering Shadow. It’s beneficial for people who use Shadow Kick as a Down Smash because you are able to go from Stinger into Shadow Kick (Shift+LMB > F) which would normally do Scattering Shadow if it was unlocked. PvP : If you have a Helrick, I personally would use that until you are 240+ with Nouver. See below for the reasoning. If you don’t feel like using Helrick, then go ahead and use Jubre until you get a Nouver. With the removal of Renown/return of Evasion, I would definitely keep a Helrick or some way to boost Accuracy on hand. Rhik talisman also returns as it is our Evasion off-hand. Urugon’s and all forms of DR will perform better in PvE, but for PvP it comes down to your other equipment. If you are running Griffon or Giath you’ll want to stick with Urugon. If you plan on going Heve or Leebur then go Muskan, basically stack which ever one you want to use as hard as you can. In order to use Leebur you’ll probably have to put on double RCE to make up for the Accuracy lose and so that is more of an end-game build, but Muskan/Heve will still do fine. For it to even out you need a PEN Heve helm vs. Urugon and Griffon/Giath. Griffon has +6 Hidden DR and 5% Resistance, Giath has +100 HP and makes you look like a Predator, the difference between the two is minimal and not something I would worry about until late in the game when you know enough to make your own decision based on your build, just take whatever is easier to get (probably Giath to start). Offin’s main advantage is the higher AP (2@TET, 3@PEN) where as Kzarka will have the higher accuracy (18@TET and PEN) when comparing them at equal Enhancement levels. There is also the additional crystal diversity provided by acquiring 2 Crit from your weapon, not something I think overly matters for PvP since you should be running foods and elixirs that max your Battle Stats anyways, but in PvE might let you use an alternative setup that allows for easier buff management without elixir/food rotations. This, and the higher Main Hand AP seem to make Offin superior for PvE. The argument for Kzarka is that once you past 269 AP, the bonus damage scaling starts to provide less of a bonus as the previous brackets. High-end builds seem to be gearing towards maintaining 269 AP and then diversifying into other areas like Evasion through the use of Caphra leveled armor and Kutum. Keeping that in mind, Kzarka *seems* to be a more balanced choice for high end PvP builds. Does Sorc need Accuracy? / TET Red Coral Earring (RCE) or TRI Tungrad? The whole point being as you gain more AP you can afford to drop Accuracy. Keep in mind the Accuracy on your Sheet when you mouse over AP does NOT include your Crystals, you need to add those in manually. As for the Red Coral Earring, most people will have differing opinions but as someone who recently went through these gear changes, I personally dropped my TET RCE for TRI Tungrad to boost my AP Brackets and saw significant returns .Some testing on the damage between RCE and Tungrad is included in the Defensive Testing document under the Misc Info>Theorycrafting section. I probably won’t use my RCE until I can be at LEAST 261 with it on, and even then at every bracket I would re-evaluate. As with anything in this game I recommend you do your own tests in order to better understand the pro’s and con’s of any setup so you can make more informed decisions. As far as what are actual Sorc combos, it’s not something we are going to cover other than the two videos below, I would suggest you look at our #PvP-Videos section in Discord/that link and see how other people fight and what you think would better fit your play style. Additional useful clips can be found in the pinned messages of #general and #class-related on the discord. If you find yourself lacking in Skill Points, here is a list of quests available to get some easy ones; Scarecrows are also now a viable way of training skill points AFK. Eva+DR Passives/Shield of Darkness : Down in the Misc.Info>Theorycrafting section there is a document that has tests on how much damage these reduce. They probably aren’t worth taking until the later stages when you’re 1700+ or when you feel you have most of the abilities you use consistently maxed. Darkness Released : Mostly used in down smash combos and to provide unprotected/non-stamina draining (although not regenerating) movement. Leveling the skill min/maxes damage but doesn’t provide much benefit to the movement/down smash utility. Midnight Stinger : Absolute version is for min/maxing damage, the Ultimate version opens up additional cancels. Ultimate can cause some issues with cancelling stuff earlier than intended (especially Dream of Doom), so my recommendation is to not use it until you become comfortable with regular Stinger. Once you feel like you’re at a point in your combos that you want to cancel things a bit faster, then you can think about putting points into it (you should be able to tell when you can get away with a faster cancel). 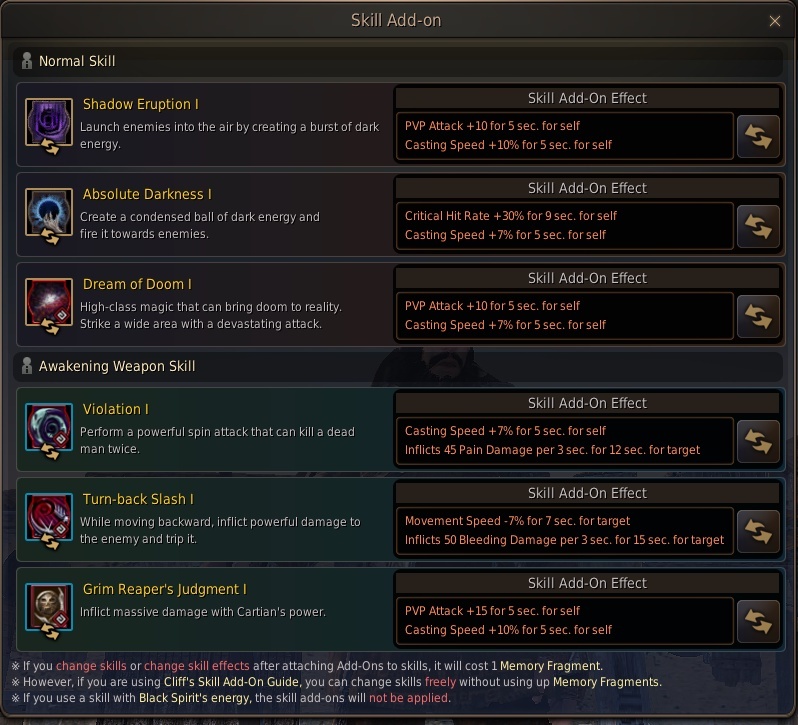 Absolute Darkness : Main use of the skill is for the add-on which gives 30% Crit that stacks with Midnight Stinger. This has it’s uses in both PvP and PvE but the add-on will only apply if you land a hit with the skill. Additional hits and accuracy scaling from leveling it up make it more likely to land a good hit and get the addon buff. You also get a bit more range on it which is useful in certain matchups in pvp. As with most utility spells, leveling it becomes more of a min/max damage thing, for PvE Rank 1 is sufficient. Black Wave : Unless you can pump this to Absolute then it’s basically useless after Awakening, can be used for filler damage and doesn’t use stamina so in places like trees you can throw it while you regenerate stamina. Even then the damage is pretty underwhelming. Not worth investing unless you’re well over 1800sp in my opinion. Sinister Shadow/Flow of Darkness : Leveling Sinister Shadow provides further distance on use and higher crit rate, but the crit doesn’t stack with Stinger, which has a higher crit buff. The main benefit of using this skill is being able to move while not consuming/regenerating stamina (S+F combined with camera turn). Personally would rather use Flow of Darkness which provides an Evasion buff that increases at the next level instead if you’re looking for a little weave. Signs of Agony : Useful for random jebaits in large scale when people have effects turned off. It’s also useful in 1v1 for fishing random CCs at range (especially against less careful opponents). Leveling the skill makes the casting animation faster, which leaves you unprotected for a shorter amount of time. Shadow Kick : Mainly useful in down smash combos and Shadow Eruption cancel. At Absolute the damage gets decent and it can be used for some additional filler damage (2x Shadow kick into Shadow Eruption for example). If you decide to use it in down smash combos I recommend locking Scattering Shadow. Scattering Shadow : Mainly used for the Accuracy buff and Shadow Eruption cancel. It has its use in the basic air combo, but at a cost of making the air smash unreliable. At absolute it deals slightly more damage than Shadow Kick. Crow Flare : Needed to access Engulfing Shadow rabam. Can be used in as filler damage in pre awakening combos if combined with Beak Kick. The main benefit of Crow Flare is being able to cancel any skill once Ultimate: Crow Flare is learned. While it’s very useful in combos, it also requires more precise inputs in certain situations (casting Dream of Doom becomes more challenging in particular). Beak Kick : Can only be used after Crow Flare and Shadow Ignition. It provides a very good evasion debuff which is useful in high level grinding locations such as hystria. It also has air smash but it’s not utilized very often in combos. Mark of the Shadow : Before absolute it’s mainly used for pulling mobs in PvE. Once skilled up to absolute it becomes useful in PvP with the 30% movement speed slow that hits up to 10 targets. It costs a LOT of skill points to get it to absolute though. Sinister Omen : The only use of this skill is bypassing the awakened iframe cooldown. For more information look into the mechanics section. Claws of Darkness : Not really useful for anything, the damage doesn’t get good enough to justify using it even at absolute. Dark backstep : Animation locked and unprotected, it’s a big no-no. Shadow riot : Currently the accuracy on this skill is bugged which makes it virtually useless. It’s a waste of 14 skill points. Abyssal Flame : Most people have this skill locked because it overlaps with the Dark Flame input. It has a decent heal and mediocre damage, wouldn’t recommend using it as it makes Dark Flame have a tiny gap at the beginning. Requires Rank 3 to be able to use Abyssal Blow. Vile Plan : This skill is not even worth learning after they took away the CC from it. It was still pretty niche before that. Cartian’s Nightmare : “Crows”, mostly used for protected AoE damage in large scale, lazy dps in pve or a bait/stamina recovery tool in 1v1. Leveling it up increases the damage by a little bit and reduces the cooldown down to 45s at max level. The main benefit is the cooldown reduction as the damage increase is negligible. It also costs a lot of skill points to level up and some players skip it until they have other abilities maxed. Shadow Ignition is regarded as superior because of high damage/low cool down combined with a CC/Air Smash component that chains well after floats like Shadow Eruption or Scattering Shadow. It can also be used after i-frames to catch people off guard. Crow Nightmare’s damage and heal doesn’t make up for the extremely high cooldown and DPS loss both in PvP and PvE you lose by not taking Shadow Ignition. This one comes more to personal preference and I would recommend trying out both. Engulfing Shadow is preferred by most as it provides us with a SA gap closer with high damage. It can also be used defensively to reposition while trying to conserve stamina. Abyssal Blow is a mid-range FG attack with a decent heal. It can be combined with Dream of Doom for ranged damage from safety, or with Abyssal Flame which is required to unlock it for a substantial amount of healing on a low cooldown. Some players recommend rebinding Shift + Z/Shift + X to different keys that may be easier for you to use. The builds from 56 – 60 include Rank III Crow Flare with the assumption you’ll be going Engulfing Shadow for your 57 Rabam. If you decide you want to use Abyssal Blow instead, than swap the points from Crow Flare into Abyssal Flame. These are the commonly used ones, I would go through the skill instructor and check out all the skills to find which ones would be most useful to you. This section will mostly cover what newer players should be aiming for gear wise. Following the 0-200AP Guide below will provide a good starting point, keeping in mind that the chart was made for a caster and we should substitute the appropriate off-hand versions for Sorceress (Jubre = AP, Helrick = Accuracy, Rhik = Evasion). This guide was also created before Urugon and Griffon and so either of those can be used in the appropriate slot as well. For any other questions a more geared player might have, they are probably answered in the FAQ at the top of the document. Concerning Main Hand, use Black Abyssal Weapon until you can obtain a Kzarka. It’s frequently asked what a sorc needs in terms of our base stats so we’ll cover this here first and then that’ll make you more informed to decide what setup you will use for the follow buffs. Cast Speed : Always maxed at 5. Critical Hit : Importance is on maxing cast speed first, and then Critical where possible, this can be most effectively done by using certain foods and elixirs and the p2w costume crystal. The Boots and Chest crystals really aren’t that important, you can throw in whatever you want. The idea is you want to be maxing out your Critical and Cast Speed, anything beyond that is a luxury. I won’t break down each of the choices here because by the time you get to the point of using these, you should have a fair idea of what each crystal does and why you would want to use them. With the release of Drieghan we now have more Crystal options available and as they are brand new until further testing has come out I can’t offer any definitive answers on what would be best, although I’m sure people will already say there is confirmed BiS setups. As with anything I encourage you to research and decide for yourself based on your setup and current gear progression what will be better suited for you. The thing you’ll want to remember when deciding where and what to use is that Drieghan crystals may be slotted into ANY slot, including Main and Off-Hand. The only absolute set-in-stone ones I would not remove would be your JIN/WON/BON Viper’s and BMC Precisions. I only list those because the other slots will depend on your build but those are applicable no matter what build you are running. In order to run a 4 food rotation, look at the duration of the foods you are using, they require them to last for 120 minutes in order to run 4 foods which means you will need the Yellow versions of those foods. Foods that last 110 minutes like Special Serendia Meal will leave a small gap but the bonuses are still good enough to make it viable in 4 food rotations. Simple Cron Meal : Really is the easiest and gives the widest array of stats, works even in Gyfin and is beneficial because of the XP gain. Use the PvP 3 Main Foods as well as Valencia Meal. If you don’t want to run 4 foods I would choose Kama, Hamburg, Valencia. There isn’t a whole lot to put here, Giant’s Draughts are the most preferably in PvP and in Hystria, any lower level grinding usually won’t require you to run elixirs. If you wanted to keep some cheap ones I would suggest Fury (5-8 AP), Shock (2-3 Critical) and maybe some Swiftness (2-3 Movement Speed) to help grind that little bit faster. If you are fighting something that hits a little bit harder such as Pila Ku, you might consider Remarkable Will (7.5-10% Less PvE Damage), Steel Defense (5-10 Damage Reduction), and Helix (8-12 Evasion). Higher end elixirs that might be used in Parties include Assassination (10-15% Back Atk Damage), Perforation (5-10 Flat Back Atk Damage), Draining (3-5 HP on Crit), Grim Reaper (1-3 HP on Hit) Detection (10-15% Critical Atk Damage), Griffon (12-17 Kamasylvia Damage), Death (5-10 Flat Critical Atk Damage) and Sky (10-15% Air Atk Damage). How do I failstack/enchant XYZ? Some of the combos or information may not apply anymore due to patch changes. Next articleEcovacs Deebot Slim2: Crumb Picker Or Vacuum?